Golf fans will need to get their sports travel insurance organised to take advantage of Portugal's courses. 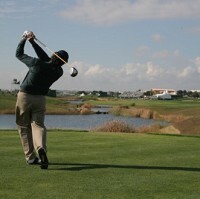 Vilamoura in Portugal's Algarve region will host the 15th International Golf Travel Market from November 12 to 15. The event, which brings together golf suppliers, buyers and members of the media, aims to highlight the potential the Algarve has as a golfing destination. The region is already popular with golfers, with its 35 courses making up more than 40 per cent of Portugal's total. António Pina, president of the Algarve Tourism Board, said 16 new golf courses had opened since the IGTM was last hosted in the area 13 years ago and the number of rounds played has increased by a fifth. He added that golf is now responsible for 12% of the area's income from tourism. Out of the Algarve's 35 courses, 26 have made it into a variety of rankings - the equivalent of a third of all the courses in Portugal.